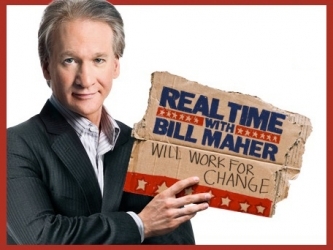 Friday night (1/27), during the “New Rules” segment of the HBO weekly hit show, Real Time, Bill Maher made yet another astute, hysterical observation that you were already aware of, but love to hear acknowledged with such sarcastic good humor: Political conservatives and the Republican candidates don’t criticize and run against real people, they create fictitious characters using the names of progressive thinkers and Democratic politicians. The best example of that is of course, the current occupant of the White House. Ask the typical, grass-roots Republican to offer some commentary on Barack Obama and more than likely he or she will repeat some of the condescending characterizations and lies made everyday by their party’s leadership and the conservative media: Obama is a closet Muslim, he wants to raise taxes, he’s a socialist, he has increased the American debt more than all his predecessors combined, he’s soft on terrorism, he doesn’t really want Americans to go back to work, just go on relief, etc. Another classic example of the “tar and feathering” approach to conservative profiling is the repeated references to community organizer and writer, Saul Alinsky, who died in 1972. Years ago already, the always delusional Glen Beck suggested that Obama was a dangerous disciple of Alinsky. Most recently, Newt Gingrich has picked up on the myth and repeated it with no new evidence to back up the claim or any explanation why the world should fear the ideas and teachings of Alinsky who promoted grass-roots community development. If Lucifer is paying attention to how Republican and Koch-Brothers propagandists portray their political adversaries, he must be wondering if the Democratic Party isn’t just a well-organized front for his Earthly collaborators. Next Next post: Ya Gotta Love Those Republicans…..